Aging is the deterioration of a cell's ability to divide and grow as it gets older. This causes degradation of the body and age-related diseases. Prevention of aging is an instinctive desire of humans; thus, it is a task and challenge of biologists to identify substances that control aging and analyze aging mechanisms. DGIST's research team have been conducting research to reverse the aging process by shifting the existing academia's 'irreversibility of aging' paradigm that suggests aging cannot be reversed. To reverse the aging process, the research team searched for factors that could control aging and sought substances that could restore cell division capacity. As a result, it was confirmed that KU-60019, an inhibitor of the ATM protein, which is a phosphorylation enzyme, restores the functions of aging cells through activation of lysosomal functions and induction of cell proliferation. The degradation of lysosomes, which are intracellular organelles responsible for autophagy and decomposition of biopolymers such as proteins and lipids in the cell, leads to cell senescence by accumulating biomolecules that must be removed in cells and causes instability of the metabolism such as removal of dysfunctional mitochondria. 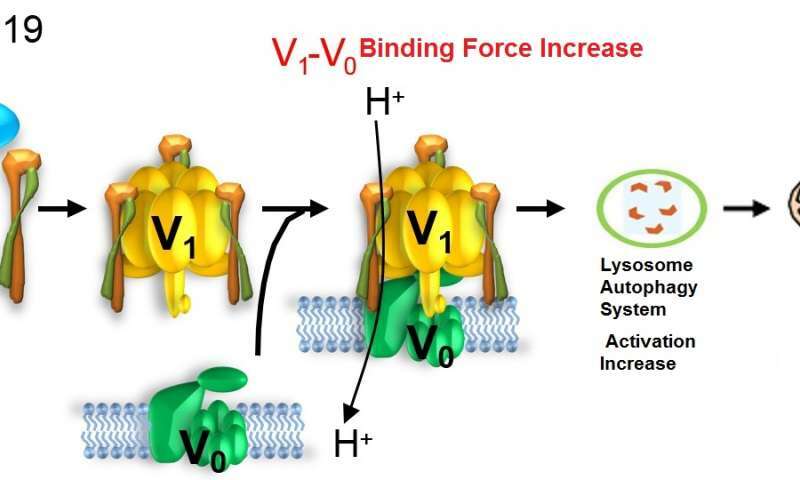 The research confirmed that as cell aging progresses, the vacuolar ATPase (v-ATPase) protein involved in the lysosomal activity regulation is phosphorylated by the ATM protein, and the binding force between the units constituting the v-ATPase is weakened, so consequently the function of lysosomes deteriorates. In addition, the team has proven that the reversible recovery of aging is possible. They experimentally demonstrated that the regulation of ATM protein activation by KU-60019 substances induces the reduction of phosphorylation of v-ATPase, thereby inducing recovery of mitochondrial function and functional recovery of the lysosome and autophagy system as well as promoting wound healing in aging animal models.